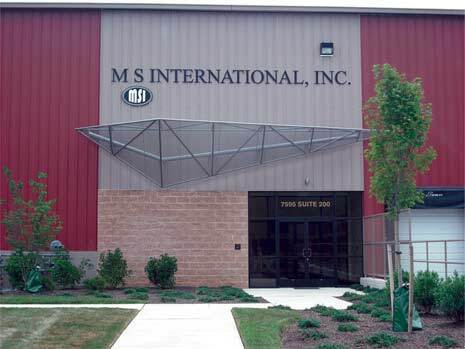 M S International, Inc. (" MSI"), the leading North American importer and distributor of natural stone today announced that it has opened a new distribution center in Jessup, Maryland to service Maryland, Virginia, and the surrounding areas. The state-of-the-art, 85,000 square foot distribution center and showroom will be the largest natural stone facility in the region. The facility is expected to be fully operational beginning August 1st, 2008. The new facility in Jessup, Maryland represent MSI's ninth major distribution center. This new center will allow MSI to significantly broaden its inventory of natural stone, porcelain, ceramic and quartz surfaces and to better service customers in the region. The facility includes a 4,000 square foot natural stone-flooring showroom with over 300 colors of granite, marble, travertine, slate, limestone, and porcelain; a 15,000 square feet loose slab showroom with over 150 colors of natural stone and quartz slabs; five overhead cranes; and eight loading docks for efficient slab and tile distribution. The distribution center will also maintain its own fleet of trucks for local deliveries. Manu Shah, CEO of MSI, said, "the new distribution center in Maryland will allow MSI to further enhance our product offering and customer service to leading wholesalers and fabricators of natural stone in the region. We look forward to introducing MSI's broad range of high quality, attractively priced natural stone to the market." M S International, Inc., founded in 1975, is a leading distributor of natural stone in North America. Headquartered in Orange, California, MSI also maintains distribution centers in New Jersey, Atlanta, Chicago, Dallas, Phoenix, Boston and Maryland. MSI also maintains international offices in Brazil, China, India and Turkey. MSI's product line includes granite, slate, marble, travertine, sandstone, limestone and other natural stone products imported from over 35 countries on six continents. In addition, MSI carries a full line of porcelain, ceramic and quartz surfaces. The company services a nationwide customer base, which includes leading retailers and wholesalers of natural stone. With a workforce of highly experienced, enthusiastic and customer driven employees, MSI strives to accomplish the vision of "being the world's premier distributor of natural stone." More information on MSI can be found on the web at www.msisurfaces.com.